You have heard the saying when life hands you lemons, make lemonade! Let me ask, what if the lemons are better than the lemonade? Despite their sour, lip-puckering flavor. These oval-shaped fruits have been proven through research to have substances to promote health and well-being. Some of the lemons in my life that I have tasted, alone leave a sour and bitter taste in my mouth. Being an introvert, it makes me want to run and stay hidden. Being abused makes me want to not trust and build walls around my heart. Being slandered, ridiculed and cut down makes me want to remain quiet. Being broken makes me feel weak and worthless. Being disappointed makes me not wanting to give all that I have to give. Being not forgiven leaves me feeling misunderstood and not loved. Being shamed makes me feel humiliated. Being afraid holds me back. Being in despair makes me want to give up. Being angry takes away the opportunity to love. Having a low self-confidence means all the above hurts and leaves a sour taste in my mouth. They are lies that bring me down even further. How can one be grateful or even receive some kind of benefit with so many lemons thrown at them? It lies in the choice of what you do with those lemons. In order to receive the life saving benefits offered by these lemons. A couple of main ingredients are needed, God and gratitude. Most of the time, I have to take these lemons daily to God. It is through God, that allows me to experience the sweet aroma of His saving grace. He sweetens the taste that without Him would leave me puckered. He uses those disappointments to soften her heart towards Him and has taught her to continue to give of herself anyways. He uses these lemons as the main ingredients for her lemonade. To build her character, His character into her life. What He allows and does in our life is never without purpose. It is to strengthen our faith and it makes our witness for Him stronger as He did in Paul’s life. Paul wrote a great amount of the New Testament which we still study today. He was an outstanding witness for God. 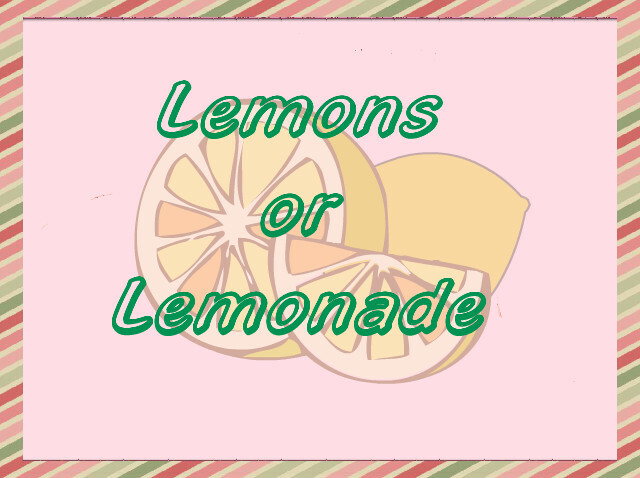 Paul’s choice was gratitude towards God and to makes lemonade with his lemons.